Now this John Henry, he would spend his days calling and emailing and burning shoe leather, turning cold calls and cold emails into prospects. There was no one who could match him, though many tried. Well, the Widget Company’s revenue was growing quick, thanks in no little part to the mighty John Henry. But looming right smack in its path was a mighty enemy – the post-internet B2B Buyer. Yikes! This buyer didn’t want to be interrupted in their day – talking to a salesperson was so scary that they hid behind email or RFPs or chat bots, or even Chris the receptionist - whatever they could. Heck many of them their never even answer the dalgarned phone! Now the Big Boss at the Widget Company decided that they couldn't go around that buyer. No sir, the Big Boss at Widget decreed the salespeople of the Widget Company were going to go through it – prospecting right into the heart of the that cold and calculating buyer. They set up CRMs and KPIs and all other sorts of alphabet soup things to track exactly what every salesperson was doin’. They paid huge commissions and fired low performers. They recycled their sales staff every 15 months and bought every new piece of sales helpin’ software they could find. All the salespeople at Widget got into the act. Millions of calls and emails would have to be made. Thousands of hours of sales training. Forests worth of sales books from sales leaders were to be read. John Henry made all his calls, took all his training, read all those books, he worked tirelessly, making 100 calls a day, sending 100 emails a day, knocking on 100 doors a day. No one else could match him. And things went this way...for awhile. But one spring day, another salesman came along to Widget’s HQ. This salesman didn't want to talk to the Big Boss, or even get a meeting. He just told a story, to anyone who would listen, a real barn burning yarn about THE FUTURE. A future where machines do all the work, where people get to relax and read books and play with their kids and go waterskiing and do all the fun stuff they want to do, but don't have time to do. At first, nobody cared. They were too busy making calls and sending emails. Then a few people started listening and this future intrigued them. Soon, the story spread through the company, like a sniffle at a day-care at first, but soon it built up steam like a locomotive. People everywhere, from the janitor's closet to the corner offices started talking, gabbing, whispering about this FUTURE. Pretty soon, the Big Boss heard all this jibber jabber. He didn't believe it - he wanted to talk to that there salesperson to set him straight - so he bought him in to hear this wacky story for himself. 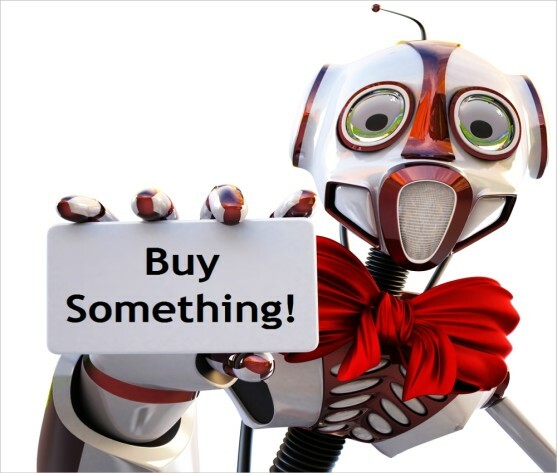 This storytelling salesperson walked in and he had with him the most wacky contraption anyone had ever saw – it was an electrical powered robot salesperson! This salesperson said it was "from the FUTURE!" and it would "replace the traditional B2B salesperson." Well, Big Boss at Widget couldn't let a claim like that stand untested. He knew he had the best salesperson this side of the Rio Grande working for him in John Henry. He called his team and set up a contest then and there between John Henry and that there robot. Everyone at Widget knew no robot could EVER out prospect John Henry. Their decades and decades of sales expertise told them "people buy from people!" So they all gathered around to watch. The salesman switched on the robot. It whirred and blinked and clickity clanked. John Henry, he just pulled out a phone and a tablet, one in each hand. The Big Boss said, "Ready, set, go!" They were off! They prospected and prospected - the dust rising up everywhere. The salespeople were howling and cheering. At the end of 8 hours, the dust settled. John Henry stood, like a mountain rising up over a valley. He had made 100 calls, sent 100 emails and had scheduled 15 prospect meetings with a value of $150,000 in his pipeline! - he knew had won. The robot? 100,000 prospect interactions, only 2 meetings, about 1000 "meh" leads to follow up on and a single sale for $500.00. John Henry held up his phone and tablet in triumph! His co-workers shouted and cheered. The noise was so loud; it took a moment for all the salespeople to see that the Big Boss had boxed up all John’s stuff was showing him the door! The crowd went silent as the Big Boss moved forward to answer. “John,” the Big Boss said, “you may be right – maybe them robots will never do everything a livin’ breathin’ human can do – but they’ll do enough so that in the end, maybe I’ll only need one or two human salespeople that add real value to the process – that offer our clients insight and can make it easy for them to buy our widgets. But John, even if I need those sales people, that ain’t you, my friend." "You see, John" Big Boss said as he put his hand on John's shoulders, "I need human salespeople that can Pre-Prospect. That can tell stories and create DEMAND. I need 'smarketers' to feed these robots. I need people who can talk to the OTHER 97%! I need salespeople like that varmint that came in here and spread his tale of the Future so well that I ended up calling him..."
“Yes you were, John, yes you were.” said the Big Boss, as he gently ushered John through the front door and made sure security walked him to his car. Some folks say that was the day it all changed in B2B sales. But them folks was wrong. You see friend, it’s always been changing. It always will change. John’s problem was he thought he could outrun or outwork that wacky technological advancement. He thought he could out hustle the future. But the blacksmith, the auto-line worker, the retail shoe salesperson, the film developer, the travel agent – they could have told John that it’s plumb crazy to fight the future. All the hustle in the world can't beat learnin'. And re-learnin'. And re-re-learnin'. If only someone had told John Henry that millions of B2B salespeople would lose their jobs to them robots - maybe he could have changed his ways! So that’s the story of John Henry. Someone told it to me, and now I told it to you. Some folks say it's true and some say it ain't. This story was based on: John Henry: The Steel Driving Man, A West Virginia Legend, retold by S.E. Schlosser.